Running at Ocean Road Community Centre, the groups will allow local people the chance to sing, perform, record, tour and more! Groups will be running every Monday from 18 February (7 - 8.30pm, £5 per session), which will include vibrant, inspiring and energetic choir, or every Tuesday from 19 February (11am - 12noon, £3 per session) which are tailored towards people who are perhaps retired, elderly and don't feel comfortable coming out on an evening. First sessions are free - simply pay as you go after that. 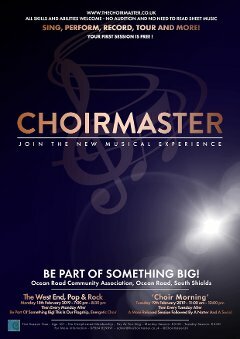 For further details get in touch with Choirmaster by calling 07854 829091 or by emailing admin@thechoirmaster.co.uk. Alternatively, you can visit the website www.thechoirmaster.co.uk. Choirmaster will allow local people the chance to sing, perform, record, tour and more!